The England rugby league team will play a mid-season Test match against New Zealand tonight at the Mile High Stadium in Denver, Colorado. It'll be interesting to see what American viewers make of rugby league (the match is being shown on CBS TV as well as BBC Two here). Some of it will be familar to them from American football - especially the six tackle rule which is similar to gridiron's four downs - but obviously much of it will be unfamilar, and will need to be explained by the commentators. The match is of course part of rugby league's mission to expand the game internationally - there's already a North American team playing at professional level, Toronto Wolfpack, and plans for another in New York. I've heard opposing opinions on the Denver Test match, part of an ongoing debate within the game between traditionalists, who opposed the Challenge Cup Final being moved from the North to Wembley in the twenties and attempts to expand the game beyond its Northern heartlands of Lancashire, Yorkshire and Cumberland through the decades, some of them successful (Australia, New Zealand, France), others less so (London, Wales), and modernisers who want to see it become a global sport. The former camp often claim that international expansion of the game is being pushed by the sport's governing bodies at the expense of the grassroots game and less fashionable, once leading but now often semi-professional, clubs in the North such as Bradford, Featherstone, Swinton and Barrow, but the decline of those sides has more complex origins, often combining deindustrialistion with mismanagement off the field. 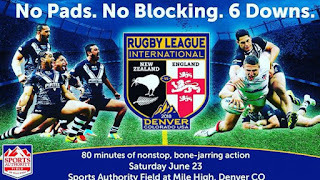 If rugby league can become even a minor professional sport in the United States, with its huge TV and sponsorship markets, surely it can only be good for the profile and funding of the game as a whole. I used to play the union version at school and, although I've little interest in sport, I regard either code as significantly less facile than football, which (tiddlywinks perhaps excepted) is the simplest game on the planet "kick that ball into that net, and stop your opponents doing the same".